The solution to eliminating market risk while participating in market gains. First book of its kind. Dr. Geoffrey VanderPal, DBA, CFP®, has used his twenty-five years of experience in financial planning to create an investment strategy that offers huge rewards with little risk. In the new book, titled "Invincible Investing", he will share the secret with people seeking better returns with very little risk. The VanderPal Method® can protect up to 100 percent of an investors principal. VanderPal has spent years perfecting the model to exceed any other current strategy. Dr. VanderPal in his doctoral research after years of industry experience and academic research developed and refined a method to truly provide principle protection while gaining market returns. This is the ONLY book of its kind. The soft cover book is available through Amazon and expanded distribution as well as Kindle. VanderPal uses examples to help one grasp the simple foundation for his innovative and tested method and defines the basic terms you need to know to become investor savvy. 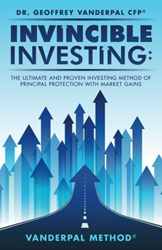 He covers a wide variety of investment choices and details the pros and cons of every option. VanderPal, who has lectured on investing to university students on four different continents, knows how to help one absorb the material and to see the practical applications for his theories. Whether a financial beginner, an investment professional or just someone looking to diversify their portfolio, the VanderPal Method® has something to teach you! Dr. Geoffrey VanderPal, DBA, CFP®, has spent twenty-five years as a financial advisor and is a respected professor of finance at universities on four different continents. VanderPal received his bachelor’s degree with majors in finance, marketing, and management from Columbia College. He received his master’s degree in business administration from Webster University and his doctorate in finance and business administration from Nova Southeastern University. He also earned a Post-Doc in Global Leadership from Colorado Technical University and maintains the Certified Financial Planner, Certified Treasury Professional and Chartered Life Underwriter certifications. In 2002, he founded a private wealth management firm and insurance brokerage agency. He helped grow it into a multimillion-dollar business. VanderPal’s business acumen has helped him succeed in several fields. He cofounded a fashion design firm and was the youngest elected village trustee in Illinois. He served as president of the Southern Nevada Financial Planning Association and as a securities arbitrator under the Financial Industry Regulatory Authority. He is appointed to a diplomatic position of Economist and Ambassador at Large for the Republic of Guinea.